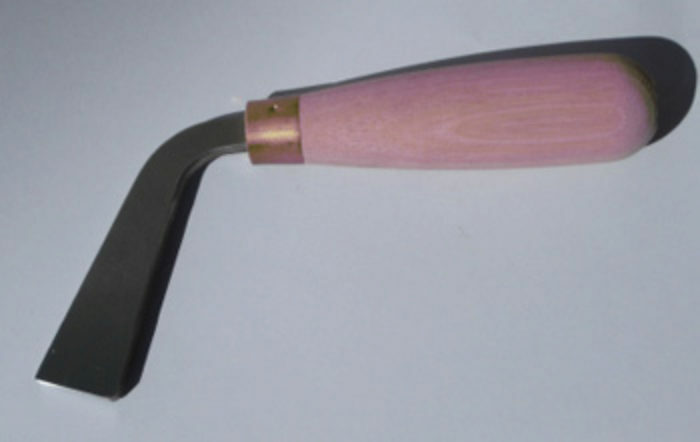 We also manufacture shorter length tuckpointing tools which we call a "stubnose" and "longnose" tool, as shown below. The Stubnose and Longnose tuckpointing tools have a blade length of only 30mm and 25mm long respectively so that they can be used for tuckpointing around restricted areas such as window sills and corners. The Longnose tool has an extended neck to better get to hard to reach areas. Our standard Stubnose tuckpointing tools are 30mm long at the end and currently available in 3mm , 4mm, 5mm, 6mm & 8mm wide tools (standard / flat bottoms). We also manufacture Stubnoses in 3 different beaded profiles: 4mm Square Beaded, 5mm Square Beaded & 6mm Square Beaded. And we also manufacture 5mm Round Beaded and 6mm Round Beaded Stubnoses. Longnose Tuckpointing Tool (25mm long at end). Available in 3mm, 4mm, 5mm, 6mm, 8mm, 10mm wide tools. 5mm Round Beaded, 6mm Round Beaded, 8mm Round Beaded and10mm Round Beaded.